Wilford Woodruff records that in 1833 all of the priesthood of the Church met with the Prophet Joseph in a room only fourteen feet square, about the size of your bedroom. Tonight, gathered in this and in some 750 other halls are more than 180,000 upon whom has been conferred that same priesthood. I would assume that among them there must be twenty-five or thirty thousand young men and boys. If the Spirit will give me utterance, I should like to speak to them. “And where did I come into your dream?” the father asked. In various times, the Lord has chosen boys and trained them for the accomplishment of his marvelous purposes—such boys as Samuel, David, Joseph who was sold into Egypt, Nephi, Mormon, and Joseph Smith. I believe that God has likewise chosen each of you for something of consequence in his grand design, perhaps not in the category of those I have named. But he loves you and he has a work for each of you to do. How great, then, is your responsibility so to live that the Spirit of the Lord may dwell in you and that the Holy Ghost may speak through you. I would that I had the capacity, the gift of the Spirit, to speak with such power that your hearts would burn with a resolution so to live as to grow in favor with both God and man. The wonderful thing is that this is not beyond your capacity. The course of our lives is not determined by great, awesome decisions. Our direction is set by the little day-to-day choices which chart the track on which we run. Many years ago I worked in the head office of one of our railroads. One day I received a telephone call from my counterpart in Newark, New Jersey, who said that a passenger train had arrived without its baggage car. The patrons were angry. We discovered that the train had been properly made up in Oakland, California, and properly delivered to St. Louis, from which station it was to be carried to its destination on the east coast. But in the St. Louis yards, a thoughtless switchman had moved a piece of steel just three inches. That piece of steel was a switch point, and the car that should have been in Newark, New Jersey, was in New Orleans, Louisiana, thirteen hundred miles away. This is a package of Edelweiss seed. The seeds are tiny, like small dry flecks of pepper. But on the face of the package is pictured what they might become—the mature plant, the flower that grows high in the Swiss and Austrian Alps, that weathers the storms that rage through those mountains, that blooms beneath the snow, that gives beauty to Alpine slopes and meadows. These tiny seeds have within them the potential for vigorous and beautiful life. They have become the symbol of a sturdy people—“small and white, clean and bright,” blessing a great land forever. So it is with boys. There lies within you an incalculable potential for good. The small day-to-day decisions will determine the course of your lives. Therefore, be smart. The Lord has blessed each of you with greater capacity than you realize. Your I.Q. may not be the highest in the world. So what? Our jails are filled with clever men who were anything but smart. I have concluded that the work of the world is not done by intellectual geniuses. It is done by men of ordinary capacity who use their abilities in an extraordinary manner. As a member of this church you have the obligation to seek learning and to improve your skills. It matters not whether you choose to be merchant, teacher, carpenter, plumber, mechanic, doctor, or to follow any other honorable vocation. The important thing is that you qualify to be useful workers in society. It is so easy and so tragic to become a drifter, a drop-out. It is so challenging and so satisfying to be a producer. In so doing, you will bless not only your own lives and the lives of those you serve, but you will also bring honor to and respect for The Church of Jesus Christ of Latter-day Saints. For your identity as a Mormon will be recognized and the image of the Church will be improved by reason of the opinion which others have of you as you serve them. You cannot afford ever to do cheap or shoddy work. You bear the priesthood of God. Be clean. “Be ye clean that bear the vessels of the Lord.” (D&C 38:42.) Be ye clean that handle and administer the sacrament of the Lord’s Supper. With President Lee we recently stood in the Garden of Gethsemane in Jerusalem where in agony the Lord foresaw the terrible suffering he must endure, suffering so intense that it caused even the Son of God to bleed at every pore. There he was mocked and betrayed and delivered into the hands of wicked men. My dear young friends, do we not mock him anew if we come to the sacrament table with unclean hands and impure hearts as we administer the emblems of his sacrifice? As deacons, teachers, and priests, you cannot afford to sit around telling and laughing at dirty stories, reading pornographic literature, watching pornographic movies, abusing yourselves sexually, or stooping to immoral behavior of any kind. Be clean for your own peace of mind. I spoke the other day with a young man who wished to go on a mission. In previous months he had been immoral. He and the girl with whom he had been associated thought they had done a clever thing. But he had come to realize that he had taken from her something precious that could never be restored, and that he had lost something of his own for which there was no compensation. With tears running down his cheeks he made his own judgment that he was unworthy to go into the world to teach to others a standard of behavior he had been unable to live himself. He had neither peace nor gladness. Be clean, for the sake of your posterity. Someday each of you will meet the girl of your dreams. If you truly love her, you would rather cut off your right arm than hurt her. Never lose sight of the fact that you are the line through which will pass the qualities of your forebears to the posterity who will come after you. Pause and think. Will those qualities be diminished or enhanced because of your behavior? Be clean, and your strength will be as the strength of ten because your heart is pure. Be obedient, my dear young friends. Be obedient to the calls of the priesthood. We recently met with missionaries in England and Europe, more than a thousand of them. They are a miracle to me, a constantly renewing miracle. Their tremendous capacity, their courage in meeting obstacles, their quiet and effective powers of persuasion—how impressive they are! How do they do it? someone asked me. That capacity has come slowly, through obedience to the calls of the Church. There is no small or unimportant duty in the kingdom of God. And out of the fulfillment of each responsibility comes the strength to undertake something new and more demanding. The men who sit tonight on the stand in this Tabernacle and the priesthood leaders across the world are for the most part the lengthened shadow of boys who tried earnestly to do what they were asked to do. President Wilford Woodruff once declared: “It does not make any difference whether a man is a priest or an apostle if he magnifies his calling. A priest holds the keys of the ministering of angels. Never in my life, as an apostle, as a seventy, or as an elder, have I had more of the protection of the Lord than while holding the office of a priest.” Is it not a marvelous thing to contemplate that the priesthood of Aaron, which you young men hold, carries with it the right to the ministering of angels! I hope I may be pardoned for repeating a story I heard the other day in Lausanne, Switzerland. That was a sacred occasion, and I view this as a sacred occasion. More than sixty years ago, a small boy on an Idaho farm went with his father to the field. While the father worked through the day, the boy amused himself with one thing and another. Over the fence were some old farm buildings derelict and tumbled down. The boy with imagination saw in them castles to be entered. He climbed through the fence and approached the buildings to begin his exploration. As he drew near, a voice was heard to say, “Harold, don’t go over there.” He looked to see if his father was around. He was not. But the boy heeded the warning. He turned and ran. He never knew what danger might have been lurking there, nor did he question. Having listened and heard, he obeyed. 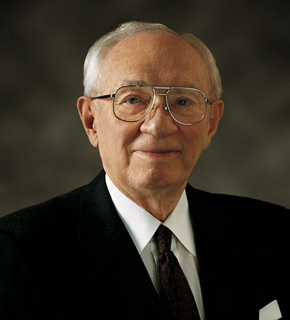 That boy today presides over The Church of Jesus Christ of Latter-day Saints. Through the years he has listened, and the Lord has magnified and protected and guided him by the whisperings of his Holy Spirit. For a period of three weeks last month, we walked together, I as his junior companion, in the ministry of the Lord. I give you my witness of the workings of the Spirit in this the prophet of our day, the Spirit nurtured and cultivated and listened to through years reaching back to boyhood. Be prayerful, and you will know that God hears and answers. Not always as we might wish him to answer, but with the passing of the years, there will come a realization as certain as the sunrise that he heard and responded. And so, watch the switches in your life, the small but important day-to-day decisions. Be smart, my dear young friends. Be clean. Be obedient. Be prayerful. To do so will require a measure of discipline, the exercise of which will bring strength and capacity for great and demanding tasks that lie ahead of you in building the kingdom of God and in filling places of useful service in the work of the world. Your lives will be satisfying and your joy will be eternal. I so promise you as a servant of the Lord, and invoke upon you that sweet peace which comes from him alone, in the name of Jesus Christ. Amen.